Oh My, How Time Flies When You're Having Fun in the Sewing Room! Has it really been 5 months since I last posted an update? Shame on me, because I have sew much to share! First of all, did I tell you how very much in love I am with this custom Waldorf Dolly made especially for my grand-daughter by my good sewing friend and fellow Virginian, Catherine Carmichael? 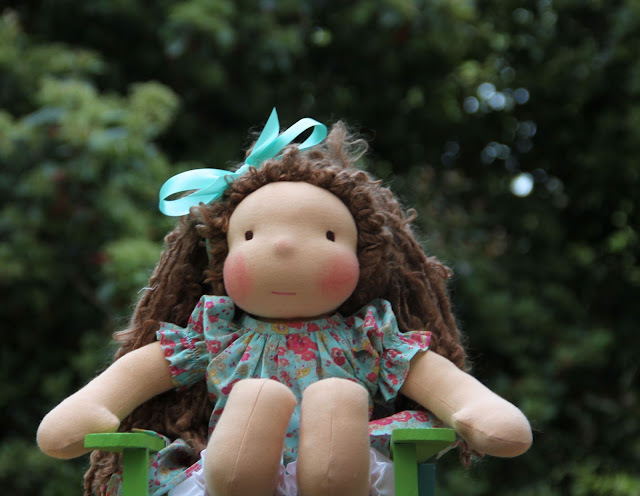 Check out her amazing dolls at Pink Petunia Cottage Dolls. There is so much to learn about these wonderful dolls and it's worth exploring further here. Thank you Catherine for a most heart-warming little friend and addition to our family! Lost in my busy schedule this summer and recent writers' block, I also forgot to mention another wonderful mention below, but please stay tuned, there is so much more I have to share in an upcoming post about sewing and smocking for the tiniest of babies! Well Spring has finally shown her very shy face here in Michigan. Just the other day I noticed that I have Tulips, Daffodils and even some Day Lilies peeking up through the ground. It's very exciting! What excites you most about Spring? Just to remind us that we too, can create a garden in full bloom, I'm bringing you a book filled with gorgeous silk embroidered alphabet letters! Embroidered Alphabets by, Di Van Niekerk, has great monograms for that special purse, wall hanging or christening gown. This book will definitely give you the itch to stitch and create a one-of-a-kind beautiful work of art! Wonderful photographs, great instructions and gorgeous color combinations, make this book a must-have for your silk ribbon embroidery library. For more Spring time inspiration see below! This beautiful *shoulder closing bishop, was made with our Spechler-Vogel Imperial Batiste. Imperial Batiste is perfect for babies because it's gentle on their tender skin. It's great for Moms on the go too, because it's washes up great, gives long-lasting wear and requires only a little touch-up pressing! Available in 60" widths in White and Ecru here, and 45" in all of our other 8 colors, here. Check out which color would look best on your growing princess, here! *appeared 3 times in Creative Needle and was originally designed by Trudy Horne. This darling romper was made using our *Swiss Sheen Sateen. It's perfect as a or Dedication, Blessing or Christening suit. This lovely fabric is a bit heavier than batiste, but lighter than broadcloth. It's perfect for baby wear because of it's ultra soft hand and delicate sheen. Because it's 100% Swiss pima cotton, it's perfect for keeping baby cool in the summer and warm in the winter. And as we all know...when babies are comfortable, they're happy and when they're happy, you're happy! So have a happy baby and stitch something up in this luscious cloth! *Pattern by Michie' Mooney #132, Sunsuit/Sundress. To become a member of SAGA or to find out how to start a SAGA chapter, click here. Find us on Facebook and join the fun! We have challenges, stitch-alongs and mystery smocks, but mostly we just enjoy sharing our projects and our passion for sewing and smocking. We'd love to have you, so "Like Us" up today!